Decluttering seems to be a big trend at this time of year. 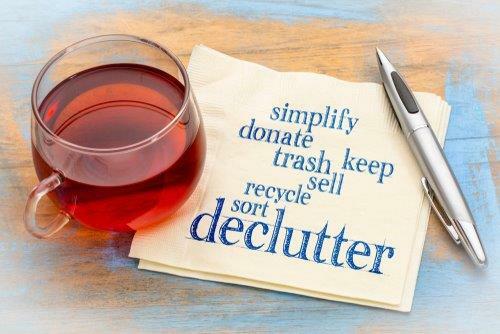 With the release of the latest Netflix series "Tidying Up with Marie Kondo", based on her bestselling 2011 book "The Life Changing Magic of Tidying Up", people appear to be opting for a simpler approach to managing their possessions. There is no doubt that when we take the time to go through our "stuff" (which we all have too much of) it can be immensely satisfying. Sorting through old clothes we haven't worn for years and discarding items that are no longer useful or meaningful to us has an empowering effect. We feel a sense of freedom, lightness and more control. There is relief in being free of the burden of too much choice and feeling obliged to keep items because they may be useful some time in the future. A similar approach can be applied to our emotional life. Often we hold on to old patterns of thinking and behaving although they no longer serve us well. While you are decluttering your wardrobes or your personal space, take some time to think about the relationships in your life. Are you holding on to old friendships just because you have known a person since school? Sometimes we find ourselves engaging with people with whom we lo longer have much in common or with those who don't treat us well or make us feel good in their company. Ask yourself if these are real friendships or is it time to let them go? When you let go of old connections it gives you the opportunity to seek out and invite new people into your life. I always love the quote from Audrey Hepburn in the movie "Charade" when she tells Carey Grant who says he wants to be her friend, "I don't have room for new friends. You will have to wait for one of them to die." Decluttering your mind of negative thoughts and harsh self criticism and replacing them with kinder thoughts and self compassion, will help you get off to a good start in the new year. Set some goals which focus on shifting any bias towards the negative to a more positive interpretation and outlook and adopt a mindset of gratitude each day. If the previous year has been difficult for you, make an effort to take note of some of the good things that happened and remind yourself that this is a new year which can represent a new beginning. Keep an open mind and be ready to take advantage of new opportunities. Remind yourself you have choices and don't be afraid of change. If you would like assistance with decluttering your emotional life or making changes and choices in life or work, get in touch with me and lets work on this together. Phone me on 0438 855328.